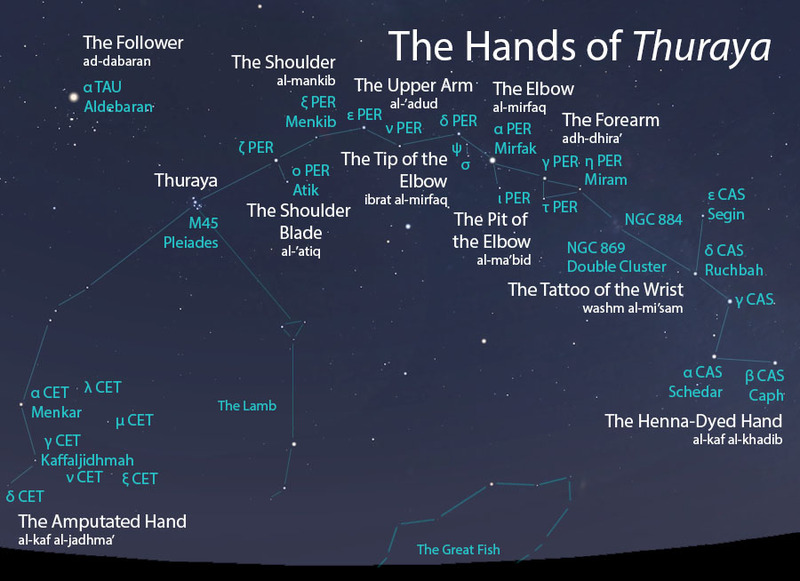 The most honored star grouping in the sky, Thuraya was often called “the Asterism/Star.” The name “thuraya” is very old. Grammatically, the word is a diminutive, and so its meaning would be akin to “the Little Abundant One”, which grammarians tend to relate to its many stars. Additionally, this meaning may refer to the abundance of rain that falls during its rain period. This possibility is strengthened by the existence of very a similar sounding word that indicates moisture. The feminine diminutive form of Thuraya gives the word a sense of endearment, like the English “dearie” or “horsey”. In legend, Thuraya is anthropomorphized as a woman. The Amputated Hand (al-kaf al-jadhma’) is one of two hands of Thuraya, shorter than the Henna-Dyed Hand (al-kaf al-khadib). The Arabic term jadhma’ may also indicate that this hand was amputated because it was leprous. The Henna-Dyed Hand features several well-defined elements. Henna, a natural dye that is green when prepared, leaves an orange stain when applied to hair or skin. Women to this day apply henna to their hands during celebrations, such as weddings, and this is reflected in the yellow-orange color of the bright star that lies near the end of the stellar Hand. The Hands of Thuraya (aydi ath-thuraya) as they appear setting in the west about 45 minutes before sunrise in mid-November. Sky simulations made with Stellarium. Thuraya is a bright, close cluster of stars known in modern times as the Pleiades star cluster. 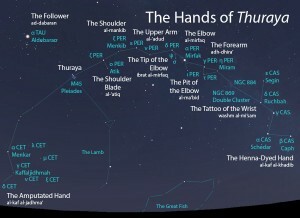 The Amputated Hand is a scattered group of stars located south of the Signs (ash-sharatan) and almost certainly included Menkar and Kaffaljidhmah (see below), but likely also included other nearby stars of modern-day eastern Cetus. The Henna-Dyed Hand is a bright group of five stars arranged in the shape of a “W” (the modern constellation of Cassiopeia) and extends in an elongated line of stars through Perseus to Thuraya. Thuraya and its Hands rise and set at different times as seen from the latitude of Tucson. Today we can expect to observe the Hands of Thuraya setting in the west (about 45-60 minutes before sunrise) from early November through early January, and rising likewise from the middle of February through the beginning of June, as seen from the latitude of Tucson. In the rain star calendars of Qushayr and Qays, the pre-dawn setting of Thuraya marked the end of the autumnal rainy season called al-wasmi. The pre-dawn rising of the Follower marked the start of the hottest part of the summer six months later. In early listings of the lunar stations, Thuraya is the fifth station of the year, and its Follower is the sixth station. This was later changed to the third and fourth lunar stations, respectively, after the stations were adjusted to begin with the vernal equinox. No star or asterism has more pieces of rhymed prose associated with it than Thuraya. As a rising asterism, Thuraya was the first star of summer (as-sayf). It is also had a mini-calendar of its own, whose rhymed prose described its positions throughout the year when observed in the evening.